Chelsea are scheduled to face Tottenham Hotspur in the first leg of the League Cup semi-final tonight. The Blues experienced a forgettable 3-1 defeat at the Wembley Stadium earlier in the campaign but they have the opportunity to make amends while grabbing the advantage in the race to reach the final. Kepa Arrizabalaga was rested for the weekend's FA Cup clash against Nottingham Forest but he should return between the sticks for the London derby. The Spaniard will be hoping for a less busier game than last time around where he was hugely responsible for keeping the scores down. In the defence, Maurizio Sarri is likely to resort to the regular defensive combination from the Premier League and this should witness Cesar Azpilicueta and Marcos Alonso feature on the right and left side of the defence with Antonio Rudiger and David Luiz slotting in between them. Likewise, the midfield should witness the returns of N'Golo Kante and Jorginho to the starting XI and the pair could be accompanied by Mateo Kovacic, who has generally been the preferred pick alongside the pair in recent months. 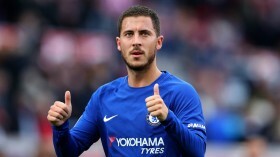 In the front line, Eden Hazard should without doubt feature in the left wing position and we are anticipating Willian to slot into the opposite flank after recovering from his minor knock. Upfront, Alvaro Morata should lead the line after bagging a brace in the most recent fixture against Forest.